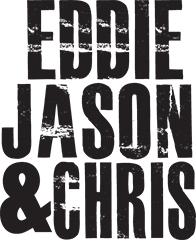 This week on Eddie Jason & Chris, the legend and awesomely taltend Max Collins of Eve6 and his new project Fitness and Kyle Morris of Unlikley Candidates. LA-based Fitness is an electro pop rock duo comprised of Max Collins (vocalist of Eve6) and Kenny Carkeet (ex-AWOLNATION keyboardist). The gents are about to release their debut EP! Check out their music video for Feel The Weight. Unlikely Candidates have been on the road all year playing headline dates, festivals and radio shows winning over audiences wherever they play, building their reputation of putting on outstanding live performances. MySpace named them the “…number one pick for who you must see at SXSW this year.” Watch the music video for their new song Violence. Plus, Jason and Chris guess the actual dialogue from the dubs of censored movies on basic cable, David from Australia has a bone to pick with Eddie, Max Collins graces EJC with a “heart in a blender” themed prank call, Max Collins and Kyle Morris talk about the music business, Chris with the headlines and more.